A former inmate wears a shirt advocating better living conditions in prison. Saying his goal was dignity, compassion and empathy for women behind bars, Gov. Dannel P. Malloy proposed a wide-ranging bill to change how women are treated while incarcerated. 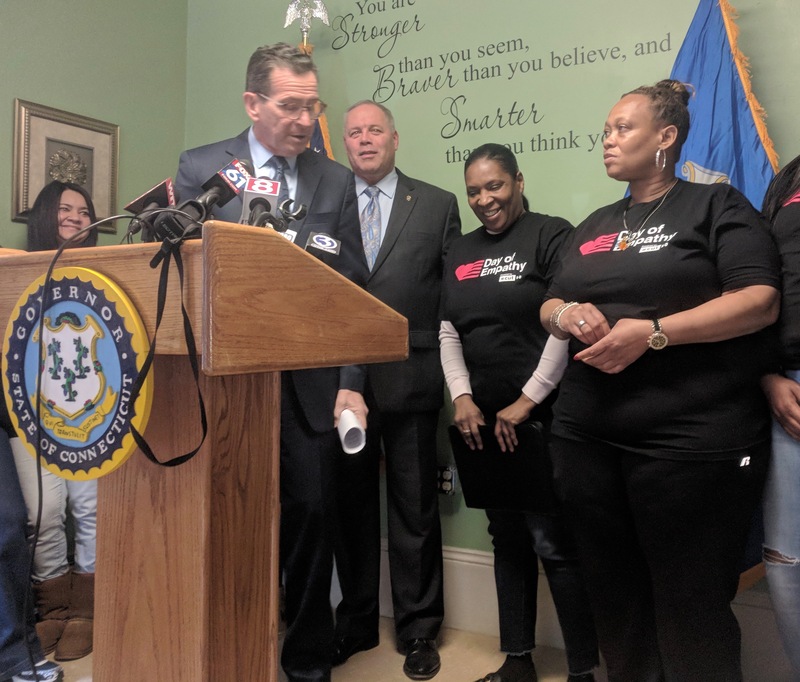 Malloy showcased his proposal, which largely focuses on pregnant women and new mothers, during a visit to a nonprofit organization in Hartford that helps women inmates transition back home. The visit came two weeks after a pregnant inmate gave birth in her cell at the state’s lone prison for women. “It is our moral obligation to ensure women in the criminal justice system are treated fairly and humanely,” he said, surrounded by women recently released from prison. Taiheba Bain, who was released a few years ago after serving 10 years for kidnapping and has since completed a bachelor’s degree in psychology, said inmates are not treated properly. Barring prison staff from shackling pregnant inmates, or those who have recently given birth, unless prison staff can document it is necessary for safety. Locating a correction officer within the room of an inmate in labor in a way to best ensure her privacy, and requiring the correction department to try its best to have a female officer stationed with the laboring inmate. Giving new mothers who are incarcerated the opportunity to pump and store their breast milk. Giving moms with infants in neonatal intensive care units the opportunity to regularly visit their children. Giving pregnant inmates copies of the department’s policies to ensure they know their rights. Housing inmates upon release from the hospital in a medical or mental health housing unit until discharged by a licensed health care provider. No longer charging incarcerated women for an appropriate amount of tampons and sanitary napkins. Establishing special policies for incarcerated mothers regarding visitation by their children, physical contact and frequency of visits. Requiring male staff to announce their presence when entering a woman’s cell and bar male staff from observing women showering, using the restroom or changing clothes, except in exigent circumstances. 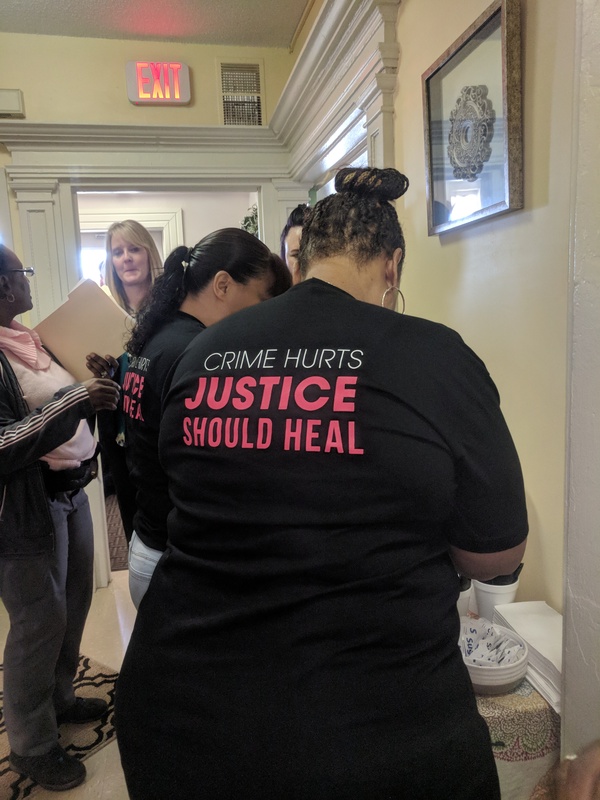 Nearly 80 percent of the roughly 1,000 women the state incarcerates on any given day are mothers, and most of them have a history of physical or sexual abuse, Malloy said. Having men view women showering or doing other personal activities exacerbates their struggle to heal, he said. Bain said the proposed change over charging for feminine hygiene products is long overdue since too often women have to chose between spending the limited money they may have either on them or on calling their children. “Most of us do not have the money coming in from our families to support us so we can make a call to our children,” the mother of two boys said. Malloy said, “That’s an unfair situation to put people in” and that fostering connections between inmates and their families is helpful for their release. The state legislature has until early May to act on the proposal.